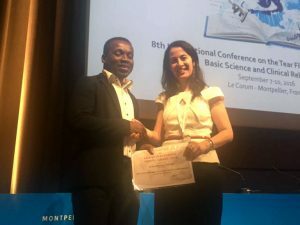 The Optical Foundation is awarding two travel grants for, one for a female and one for a male Ghanaian level 500 Optometry student to attend the 2019 British Contact Lens Association clinical conference in Manchester, United Kingdom. To encourage talented persons to pursue full-time careers in optometric research and education in schools and colleges of optometry, The Optical Foundation in collaboration with CooperVision UK and The British Contact Lens Association (BCLA) are offering two travel grants, one to a male and one to a female level 500 Ghanaian Optometry student, to attend the 2019 BCLA Clinical Conference in Manchester, United Kingdom, from 31 May – 2 June 2019. Upon return from the conference, the successful candidates will be required to submit a two-page report and photos of their experience. In addition, the successful candidates will give a presentation to their peers on the conference proceedings. To be eligible, applicants must be a level 500 Ghanaian Optometry student enrolled in an Optometry program in Ghana.